Too much stuff is taking up too much of our lives. In 1930, the average American had 36 items of clothing. Today the average American owns over 150 items and still has trouble getting dressed every morning. Meanwhile, the fast-fashion industry is telling us that the more we buy, the more options and stylish we’ll be. But I’m not buying it. CONSUMING THINGS WILL CONSUME US. Consumption creates an element of discontent around what we have in our lives today. If we can stop obsessing over what we don’t have and want, we can begin to make the most of what we already own. Similar to how the fast food industry is great at providing that’s fast but from poor ingredients. The same is true for fashion. Stores have changed over the years from creating quality clothing to fast, cheap fashion. After starting my new gig at Cladwell, they encouraged me to think about why I was shopping so much. Hearing this caused a bit of inner panic… Could I shop less? But, I like to shop. Isn’t this ‘merica? See the thing is, I thought shopping was making me more stylish and happy. But what I didn’t realize, is that I was sold a lie. Consumption creates an element of discontent around what we have in our lives today. The more I shopped the more stylish I thought I was. The shot of adrenaline confirmed that… so I thought. The truth is, if we can stop obsessing over what we don’t have and want, we can begin to truly see what we have and need. I had no idea where my clothes were coming from. Nor had I ever really thought about the people who made them. It never once occurred to me as to why they were so darn cheap. Yet, the more I thought about these questions, the more uneasy I became and the less I could ignore the problem. I knew that I was ready to make a change, but if I didn’t have a way to keep myself from shopping I would easily slip back into the very same habits I always had. If I learned anything from trying every trendy diet ever, it was just that. To make this stick it wasn’t good enough to just put my closet on a diet. Instead, I would need to change my lifestyle. To be honest, I was skeptical. Could changing my closet make me feel any different? 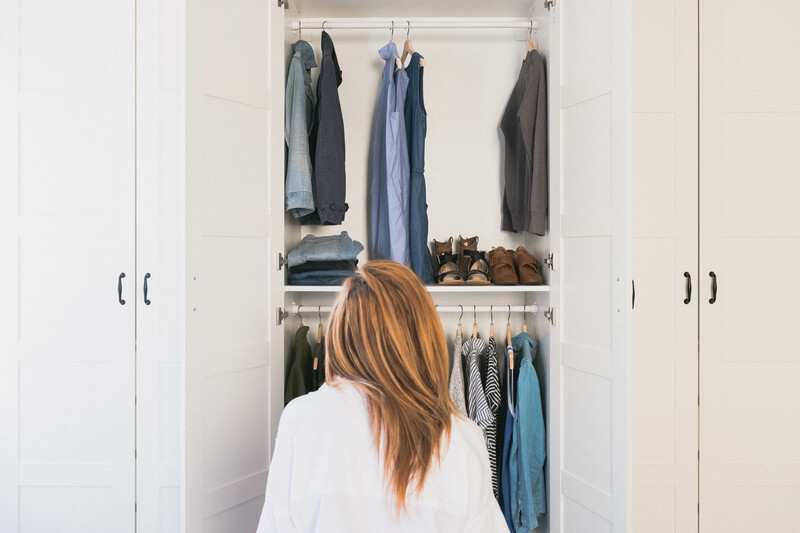 I started by using Cladwell’s daily outfit app – it was a simple way to see if I could create a capsule wardrobe and start living with less. I created my first capsule and went from 450 items (top photo) down to 100 items (bottom photo). It wasn’t because I didn’t have enough of the right clothes. It was because I was unable to see the ones I loved. With the app, I can now see outfit suggestions every morning based on what the clothes I own and love. Plus, it takes into consideration what the weather is like. And it’s so freeing. We are all encouraged on a regular basis to buy this, buy that, buy this for that cheap price. Whether we consciously know it or not, this increasingly fast sales cycle has an impact us. It creates an element of discontent around what we have in our lives today. The idea of regaining control of when, why, and how I shopped was exciting. Knowing that whatever I picked out of my closet I would love to wear was freeing. Having a capsule wardrobe was a daily reminder that I was in control of my own choices, choosing to buy less just so happens to be one of them.